Aviator Sports now offers Bubble Soccer Birthday Parties! 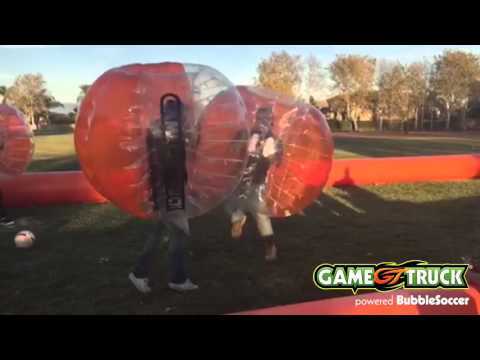 Bubble Soccer is as much fun to watch as it is to play. Imagine crawling inside a giant air bag and bouncing around like beach balls, bouncing off your friends. It’s a blast! Our Bubble Soccer Birthday Parties are a great time for everyone. 25×50 inflatable arena with 4 v 4 play. It’s bashing fun, resulting in countless laughs! Bubble Soccer Birthday Parties consist of 1 hour of Bubble Soccer and 30 minutes in the party area. In the party area, your guests will enjoy food, beverages, and a birthday cake to celebrate your special day. The party room will be decorated with balloons, and table covers and plastic wear are included! From set up to break down, our birthday party experts will take care of everything. We’ll do all the work, you have all the fun! Interested in planning a bubble soccer birthday party at Aviator Sports? Add to the fun of your child’s bubble soccer birthday party with these add-ons!